President Abdulla Yameen has called on all parties to respect the Criminal Court’s verdict against former President Mohamed Nasheed. “The government calls on its international partners to engage constructively, based on mutual respect and dialogue in consolidating and strengthening democratic values and institutions in the country,” reads the brief statement. 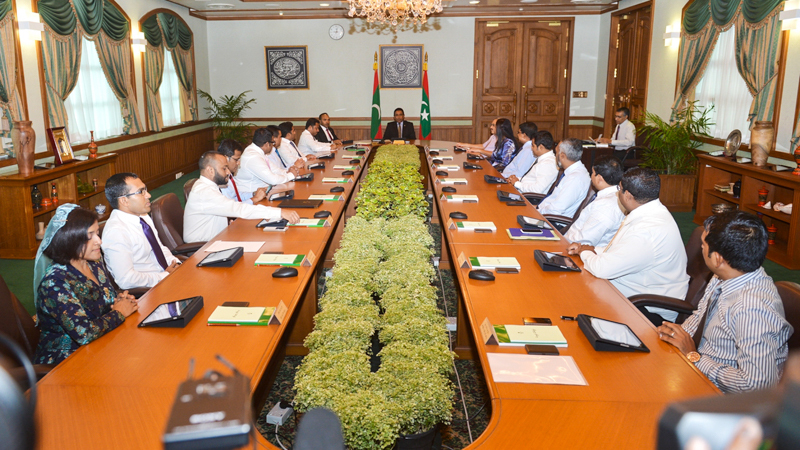 President Yameen as head of state could not “interfere in judicial proceedings and is not to blame for court proceedings,” he said. Commonwealth Secretary-General Kamalesh Sharma released a statement yesterday noting that the intergovernmental organisation would continue to closely follow the judicial process after the verdict. The Commonwealth urged restraint and advised peaceful resolution of “differences of view” through dialogue. 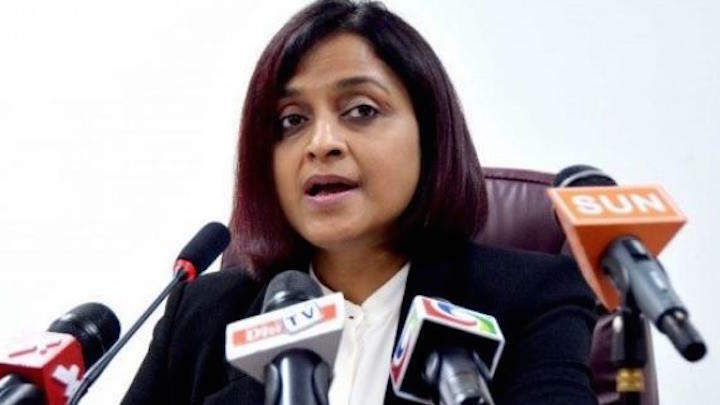 “The Foreign Minister of Maldives, Hon Dunya Maumoon, has made recent public comments welcoming constructive and close dialogue with international organisations,” the statement read. The Commonwealth assured its commitment to working with the Maldives to address issues of concern. “All societies should have the space and opportunity for dialogue in order to ensure that universally shared values are advanced, and to create a stable and harmonious future,” the statement continued. The Asian Centre for Human Rights (ACHR) has meanwhile called on the UN to hold an emergency session on the situation in the Maldives. “The trial is a travesty of justice – Judge [Abdulla Mohamed] who claims himself to have been illegally detained for which former President Nasheed was charged under terrorism charges still heads the Criminal Court trying Nasheed and effectively allowed his deputy, Judge Abdulla Didi, to convict Nasheed in a kangaroo trial. 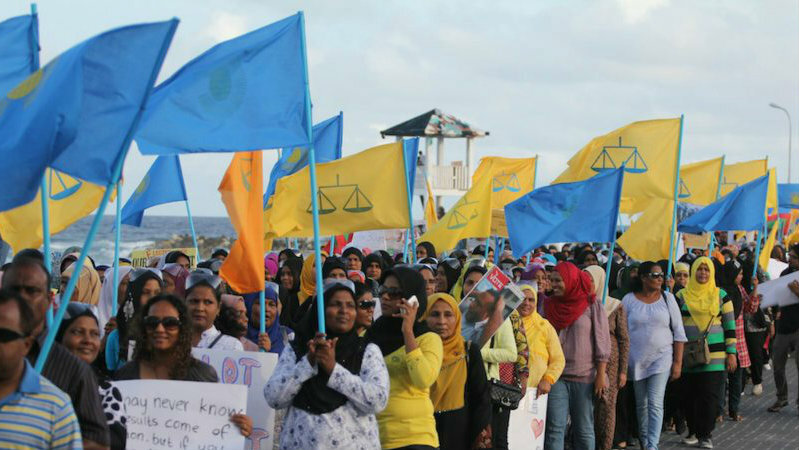 If the United Nations and international community fail to intervene now, democracy may never return to the Maldives,” said ACHR Director Suhas Chakma. “The trial of Nasheed was riddled with numerous violations of basic human rights and fair trial standards, and his conviction must be condemned. This is a clear case of political persecution and therefore the verdict is not surprising, considering the manner in which the court has conducted the trial,” said Forum-Asia Executive Director Evelyn Balais-Serrano. The international community asking the Maldives to abide by commitments under UN conventions does not amount to “undue interference,” UK High Commissioner to Maldives John Rankin has said. In an interview with private broadcaster Raajje TV in Malé yesterday, Rankin said decisions on domestic matters were up to the Maldives as a sovereign nation. “But it is legitimate for one country to [remind] another country to abide by the undertakings which together we have signed up to,” he explained. Last week, Foreign Minister Dunya Maumoon hit back at statements issued by the Commonwealth, India, Canada, EU, and the UN expressing concern with the denial of legal representation to former President Mohamed Nasheed following the opposition leader’s arrest and prosecution on terrorism charges. “Those who prefer to issue public statements about an on-going legal case, or on a domestic political situation, are advised to do a basic fact-check, before bandwagoning on to accusations made by a political party,” Dunya said in a statement. Dunya insisted that due process was followed in Nasheed’s arrest and prosecution. 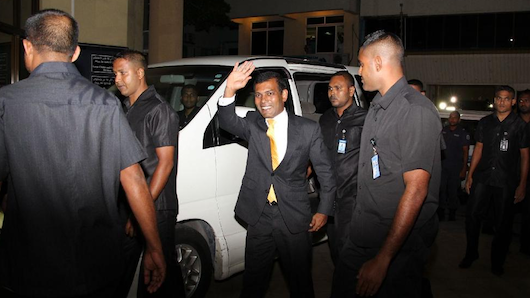 Nasheed arrived in court on Monday (February 23) for the first hearing of his trial without legal representation and with his arm in a makeshift sling after police manhandled and dragged the former president into court when he attempted to speak with journalists. Rankin said the international community was watching developments in the Maldives closely and that the British government “remains very concerned” over Nasheed’s detention. “The international community as a whole is watching what is happening here. Our concern is that President Nasheed, like any other citizen of the Maldives, should enjoy due legal process, that this fundamental right should be protected, and that we have transparent court procedures,” he said. 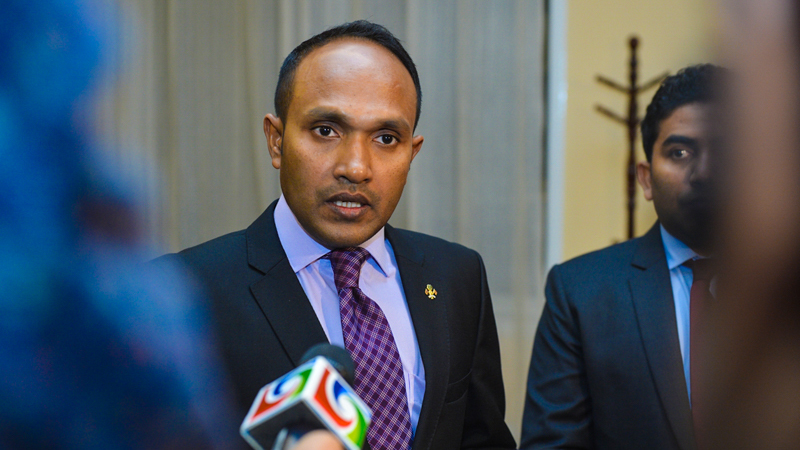 The Maldivian government has assured Nasheed’s safety following discussions on Thursday (February 26), Rankin added. Prior to Rankin’s arrival in the Maldives, UK Foreign Office Minister Hugo Swire issued a statement stressing the importance of following due process and respecting Nasheed’s rights “for international confidence in the Maldives”. 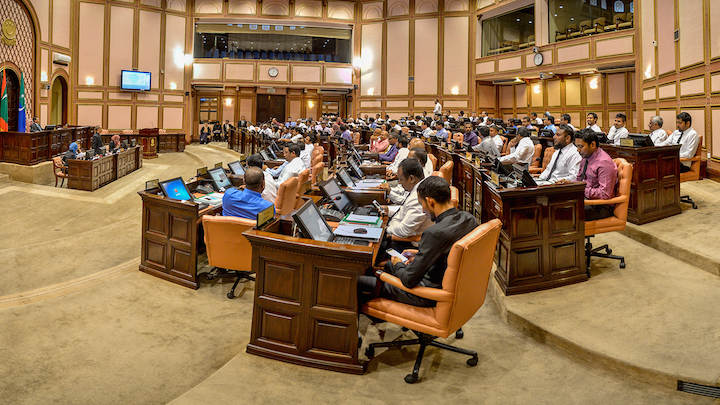 “It is also incumbent upon the Government of Maldives to ensure his safety. We urge calm right across Maldives and we encourage all parties to act with moderation and restraint,” reads the statement. Rankin meanwhile referred to the Maldives’ obligations as a signatory to relevant UN conventions. Rankin said the UK was “a friend of the Maldives” and that stability in the country was important to Britain with thousands of British tourists visiting the Maldives annually. “As friends though, we are also honest friends and sometimes honest friends have to raise difficult issues, but we raise it precisely because we want to support that continued stability here,” he said. Rankin said the Commonwealth was “a consensus organisation” of sovereign nations working together.